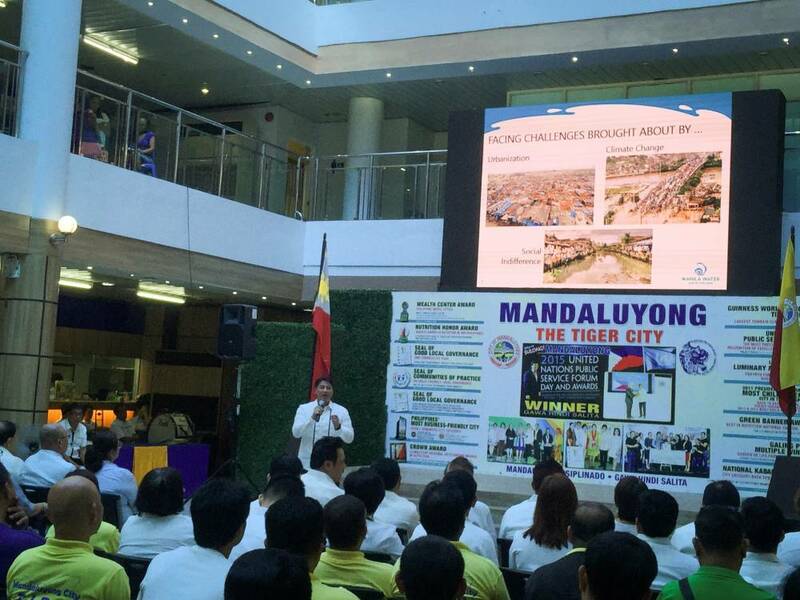 Manila Water’s environmental advocacy gains ground in Mandaluyong | Manila Water Company, Inc.
Manila Water Corporate Strategic Affairs Group Director Jeric Sevilla shares Manila Water’s Toka Toka environmental advocacy with chief executives and public servants of the local government of Mandaluyong. Manila Water lauded the city government of Mandaluyong for its all-out support in promoting “Toka Toka”, Manila Water’s premier program on used water management. Manila Water and Mandaluyong have been conducting regular information, education and communication programs in the different barangays to spread the word on the need for used water management as a major contributor in reducing pollution of water bodies in the city. Both agencies have also jointly undertaken the clean-up of the Maytunas Creek in the city. Speaking before the chief executives and employees of Mandaluyong City Hall, Manila Water Corporate Strategic Affairs Group Head Jeric Sevilla Jr. discussed the importance of the need to treat used water from households to help revive the waterways in the metropolis. Sevilla also cited four ownable acts as part of the Toka Toka environmental movement that include (i) segregation of solid wastes; (ii) desludging of septic tanks every five years; (iii) connecting to Manila Water’s sewer lines and (iv) educating the residents and community through information, communication and dissemination drives. Sevilla added that Manila Water has been a loyal supporter of environmental programs of the national government and local government units and called on all employees of the local government to do his share in protecting the environment. Toka Toka is the first and only used water management program in the country today.